Last week we gave you the first five of the 9 Simple Ways to Save Money & Stretch Your Wedding Budget, and now it's time for the final four. The following tips for planning a wedding will be very helpful when it comes to choosing details about the reception. WhereBridesGo.com has many affordable wedding accessories online that allow you to throw an amazing celebration without "breaking the bank." 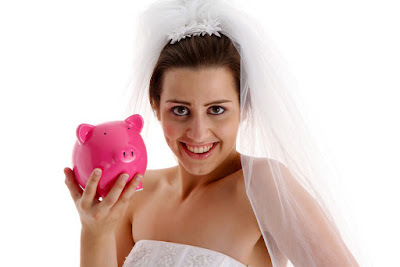 These tips will stretch your wedding dollars a bit further. Strive to use things that you buy for the wedding in more than one way. Favors can double as place cards, aisle decorations from the ceremony can be used for centerpieces at the reception, and table numbers can be placed on wine bottles being served at each table. Getting creative with how you use every single item can cut some of your costs in half. Flowers are an item that the bill can rise on quickly. You don't have to skip them completely to save money. Just use other things along with them to fill up space. There are lots of beautiful kinds of greenery that you can use for filler along with a few blooms. Smaller arrangements on each table can be balanced by the addition of candles, photo frames, lanterns, or other props that tie in with the rest of the wedding decor. Bridesmaids don't need to carry a full, expensive bouquet that they will probably throw away after the reception. A single, long-stemmed flower looks just as wonderful coming down the aisle in their hands. If you find an outdoor venue with lots of its own natural florals, you won't even need to decorate that space at all. Another item that has one of the biggest price tags at a wedding is the food and drinks being served. If you don't have the budget for a full, sit-down dinner, there are other ways to keep your guests satisfied and well-fed. You can plan your reception to take place early in the day. Lunch and cocktail hour menus are much less expensive than dinner. Lots of couples even choose to get married in the morning and host a wedding brunch. Who doesn't love breakfast food? As for the bar, it is nice to offer your guests something to drink, but there is no rule stating you have to give them unlimited cocktails all evening long. Choosing to serve only 1 or 2 signature cocktails, or just beer and wine, is perfectly acceptable. If you think that your guests will want more options than that, have a cash bar available in addition to the drinks you are hosting. One great trick for making your wedding cake feed lots of people is to have a small one visible for the official cutting, and inexpensive sheet cakes to cut up and serve hidden away in the kitchen. Everyone gets a piece and you didn't have to pay hundreds of dollars for a multi-tiered cake. Another option is to order a plain cake and add simple embellishments yourself. One of our unique wedding cake toppers and a few flowers is plenty of decoration to make a cake that everyone will rave about. Also, if you don't tell the baker it is for a wedding, the price may be a little lower too. Visit our online wedding supply store to find affordable options for nearly everything you will need for your ceremony and reception. WhereBridesGo.com always offers wonderful prices, and when you sign up for our newsletter and follow us on social media, you'll be the first to know when we offer special discount codes. The clearance section on our website is always being updated with new unbelievable specials too, so always check there when you shop with us. Happy planning!